The Thursday afternoon news conference was wrapped up, but Jameis Winston still needed to get some things off his chest. 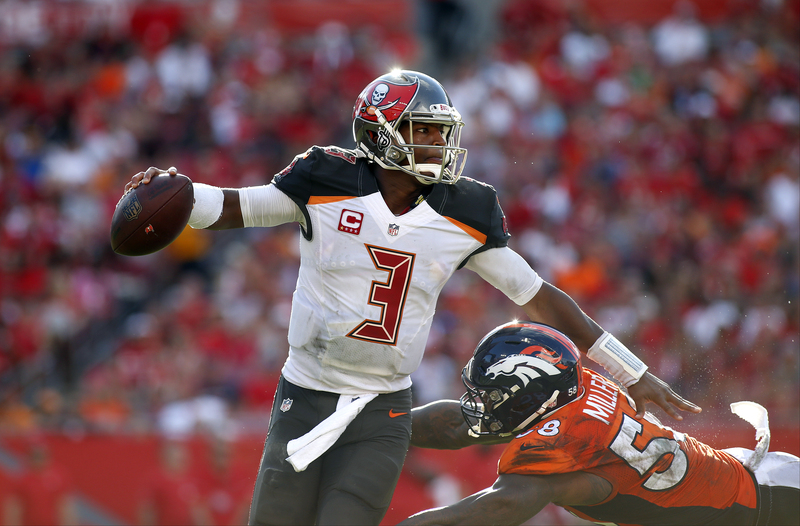 Visibly humbled by his wack performance in the Tampa Bay Buccaneers’ 27-7 loss to the Denver Broncos last week, the second-year quarterback went in on himself even harder in private post-conference. Then, Winston made his best move in weeks: He picked himself up and focused on trying to get his head back in the game. “You know, right now, yeah, it’s kind of hard,” Winston told The Undefeated at the Buccaneers’ headquarters in Tampa Bay, Florida. “It’s also a challenge that you’ve got to take on, and it’s something that can help me grow as a player and as a man. As the Buccaneers prepare to face the Carolina Panthers on Monday Night Football, their struggling young signal-caller (Winston is 22 and in his second year in the NFL) is their biggest concern. His red-hot start to the season – Winston had four touchdown passes in a season-opening road victory over the Atlanta Falcons – has been obliterated from memory, thanks to a three-game losing streak in which the former No. 1 overall draft pick often played like a bottom-of-the-roster backup. Winston has eight interceptions over the first four weeks of the season. Only New York Jets quarterback Ryan Fitzpatrick has more with 10. Although not all of Winston’s turnovers occurred on “What-was-he-thinking?” plays, he has made way too many questionable calls from the pocket. Buccaneers coaches agree. In meetings this week, Winston’s decision-making has been a major point of emphasis. But don’t get it twisted: The franchise’s confidence in Winston remains as strong as his passing arm. At the game’s most important position, Tampa Bay is in it for the long haul, team officials say, because Winston possesses the smarts, physical tools and competitiveness needed to be an elite passer. He just has to stop throwing the ball to the other team so much. But it’s not like Buccaneers are babying the dude. 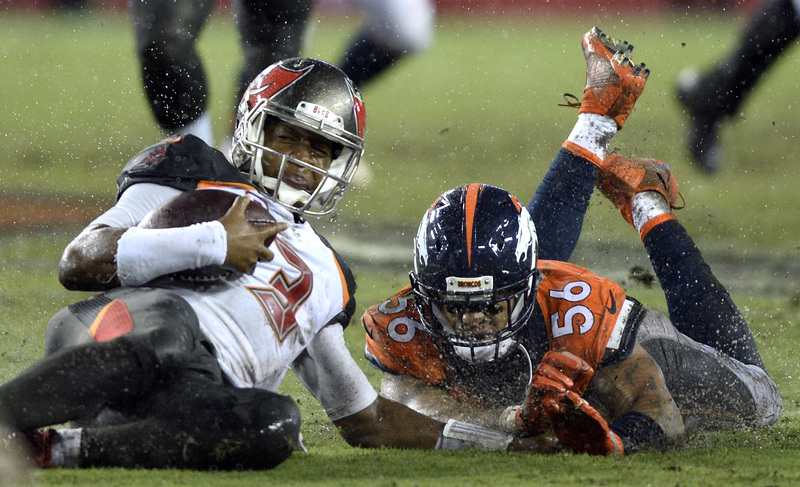 Tampa Bay Buccaneers quarterback Jameis Winston (3) and Denver Broncos linebacker Shane Ray (56) slide across the grass during the fourth quarter of an NFL football game Sunday, Oct. 2, 2016, in Tampa, Fla. Asked to assess Winston’s performance after he was picked off twice and sacked five times by the Broncos, head coach Dirk Koetter didn’t sugarcoat it, telling reporters he was “very concerned” about the turnovers. By late this week, the mood in the Buccaneers’ building hadn’t changed. Offensive coordinator Todd Monken explained that Winston can get his swagger back simply by keeping the ball away from opponents and why, despite the picks, the Buccaneers remain all in on him. “If you take the full body of work, have there been some bad decisions? Yes,” Monken told reporters bluntly. “I love that kid,” Monken continued. “You talk about a competitive spirit and a will to want to compete and make every play. That’s who you want to build your team around. Is he there yet? No. Are we there yet, collectively? No. He has taken risks throwing into coverage and been burned, badly. By early in the second quarter in the Broncos’ rout, cornerback Aqib Talib already had two picks. It’s true that no Buccaneers observer with a clue can question Winston’s toughness. The young fella consistently stands firm in the pocket and tries to extend plays. On the other hand, Tampa Bay’s coaches would prefer it if Winston occasionally tried another approach: throw the ball away more or, if necessary, take a sack. Granted, avoiding unnecessary hits won’t get you on SportsCenter. It is, however, a proven method, in keeping offenses stay on the field – that whole live-to-fight-another-day thing. When you speak with Winston, you get the sense he isn’t just giving lip service. A former Heisman Trophy winner at Florida State, Winston genuinely seems to have only one thing on his mind at work: achieving everything the Buccaneers expect of him. Tampa Bay’s coaches say that assessment is spot-on. That’s why they’re confident they’ve only hit a bump – not a wall. Doug Williams could have told you that, too. Williams achieved icon status after he became the first African-American quarterback to win a Super Bowl – and be selected the game’s MVP – in the Washington Redskins’ rout of the Broncos in 1988. While mentoring Winston for the past few years, Williams has become convinced that Tampa Bay got it right at quarterback. Quarterback Jameis Winston #3 of the Tampa Bay Buccaneers is pressured by outside linebacker Von Miller #58 of the Denver Broncos as he looks for an open receiver during the second quarter of an NFL game on October 2, 2016 at Raymond James Stadium in Tampa, Florida. In his position as a Redskins player-personnel executive, Williams watches a lot of film, “and you just don’t see a lot of guys who can do what he does,” Williams added. “I was actually watching some tape earlier, and he made a couple of throws that you would call big-time throws. The anticipation was there. That’s the hardest thing. Last season, Winston showed growth by reducing his turnovers. Through four games in 2015, Winston had seven interceptions. Through the final 12 games, he had eight. Winston also passed for 4,042 yards – only 23 behind Josh Freeman, who set the single-season franchise record in 2012 – with 22 touchdown passes. Tampa Bay finished last in the NFC South at 6-10. So far, the team improvement that management hoped to see hasn’t materialized. Of course, that’s not all on Winston. The Buccaneers have missed the playoffs the past eight seasons. Their machine is still waiting for some key parts. “I would be remiss if I sat here and said we’re loaded everywhere,” Buccaneers general manager Jason Licht told me. “There are, obviously, areas that we need to upgrade, which would not just help Jameis but would help the entire team. Moving forward, Winston is a key to making it happen. Licht leaves no doubt about that. That’s the plan. Winston just has to figure out how much. Except speed. Winston needs to get up fast. Quickly.